Every dog needs a home. For those dogs who can't sleep inside with humans, a dog house is needed. You can buy a dog house at a hardware store, but if you have multiple dogs, a retail dog house will be expensive and difficult to transport home. 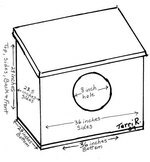 The dimensions of a mid-sized dog house, reserved for one dog, are 25 x 30 inches. Those dimensions produce a rectangular-shaped house. You can add room for another dog by doubling the dimensions, so the size of a house for two mid-size dogs is 45 to 50 x 55 to 60 inches. Lay out all wood material and sketch the structure on paper. Adjust dimensions for sketch by moving the decimal point to the left so that a 48.0 inch length is reduced to 4.8. Sketch all house angles and the roof apex at 90 degrees. Mock up the structure, without fasteners, according to your sketch. Ensure that all angles and the roof apex fit at 90 degrees. Construct the floor. Nail the two 54 ½ x 2 x 4 boards to the bottom length-wise edges of the 48 ½ x 54 ½ weather-treated sheet. Center another 54 ½ x 2 x 4 to the floor, and nail. Construct the building frame. Nail together the two 44 ½ x 2 x 4 boards to the inner ends of two 54 1/4 x 2 x 4 boards. Repeat for another set. Nail four 44 ½ x 2 x 4 boards to the inner corners of the two rectangle frames. Nail the completed frame to the floor. Nail the two 48 ½ x 54 ½ sheets to the sides of the rectangle frames. Nail one 48 ½ x 48 ½ sheet to the back end of the frame. Cut an entry into the other 48 ½ x 48 ½, and nail to the frame. Sand all edges, dust the parts, then apply sealant. Cut the 43 ½ x 43 ½ board from corner to corner. Connect the two triangular pieces by nailing the four 44 ½ x 2 x 4 boards, rotating the board side to be flush with the sheet edge, to the inner bottom and upper corners. The two boards connecting the upper corner will touch, and they should also be rotated outward. These boards are rotated outwards to serve as a seat for the roof. Nail the four remaining 44 ½ x 2 x 4 boards to the width-wise edges of the 50 ½ x 58 ½ weather-treated sheets. Nail the two weather treated sheets onto the top of the triangular frame. Sand all edges, dust the roof, and then apply sealant.